Having established that my experiment with quick breads at high altitudes was a mild scientific disaster (but a surprise culinary success nonetheless), we now move on to the yeast-leavened bread. The control loaf made in Chicago was nothing special; it had a good and complex flavor, and a moderately open crumb, but had a mediocre crust. If I’m honest, the crust alone ruined an otherwise acceptable bread for me. If it had been crisper, I would have been more satisfied; but I figure I’m allowed a little bread snobbery these days. While making the control yeast bread in Chicago, I attempted to mimic the anticipated baking conditions in my sister’s Denver kitchen as much as possible. I didn’t use my baking stone (she doesn’t have one), I didn’t use a spray bottle to create steam in baking (she doesn’t have one), and I used all-purpose flour (not sure if she’d have bread flour around). But I overlooked one major technique in all this: I weighed out my flour, like I always do. My sister doesn’t have a food scale. Foiled! I was stuck measuring out my flour by volume, a major faux pas in the sort of bread-making I’ve become accustomed to. Not only that, but there’s a reason I long ago bought that food scale: I’m notoriously bad at measuring out dry ingredients by volume consistently. Do I scoop and level? Do I spoon the flour into the cup, then level? Do I scoop and shake to level? I think I do all three, depending on my mood. You may see my conundrum. So measuring by weight wasn’t an option. I did my (ahem) level best to measure consistently, but there were four whole cups of flour in that recipe. I had to measure exactly the same amount, exactly the same way, four times. Ridiculous. I don’t know how you people do it. And! Her brand of flour was different, to boot. It would certainly weigh differently than my brand; perhaps that cup of flour wasn’t really 4 1/2 ounces, like mine, a fact which would obviously throw off the hydration level. How on earth was I supposed to re-create this recipe at all? After measuring the flour as best I could, I added the prescribed amount of water and mixed. The flour didn’t all moisten; in fact, there was a veritable flour desert in the bottom of the bowl. It was so dry, I added nearly an entire extra cup of water before it came together. Now, part of this trouble was from my own hands, and my stupefying lack of ability to measure by volume. But part of it was also due to complications of high-altitude baking, namely faster water evaporation. Because water evaporates much more quickly at high altitudes, flour tends to be drier and will soak up more water than at sea level. It’s hard to tell how much water your flour will absorb until you start mixing, but a good general rule is that at higher altitudes, you should assume that you need more liquid in your dough. This is partly why you always want to hold back a handful (or three) of your flour when mixing bread dough, no matter the altitude; it’s far easier to add flour to a wet dough than to add water to a dry dough. Other than the issues with mixing, however, this bread turned out relatively similar to the control loaf. It was a little airier than the original, because yeast actually works faster at high altitudes than it does at sea level (I’ll be discussing that in more depth in Saturday’s post). The crust was still less than crisp and wasn’t much darker, but happily had a much less chewy bite. (The oven may or may not have been hotter than mine at home; my oven has a digital temperature control, wheras my sister’s oven has a less-than-precise and forty-year-old dial control.) The crumb was pleasingly open, and had a moderately complex overall flavor. 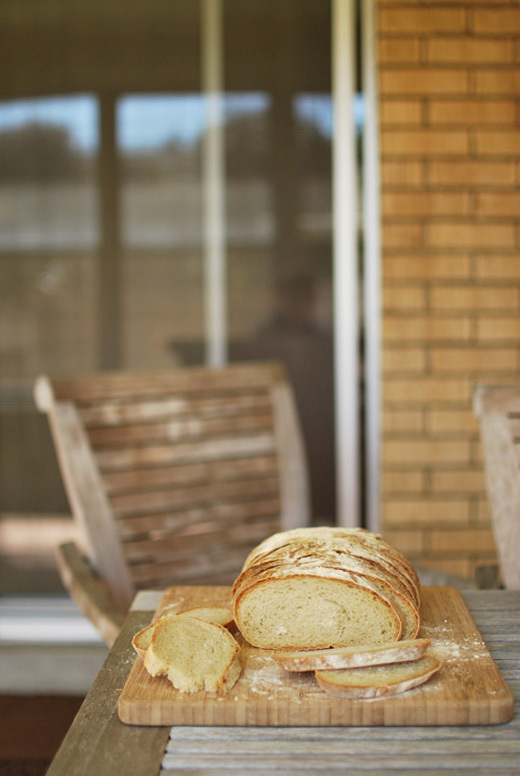 This loaf was not necessarily better than the original, but neither was it a lesser bread. I’m writing this recipe as I made it, extra water and all. You may or may not need to add extra flour, depending on your volume-measuring abilities. This experience continues to be fascinating for me, and I hope all of you out there reading this are enjoying it too. 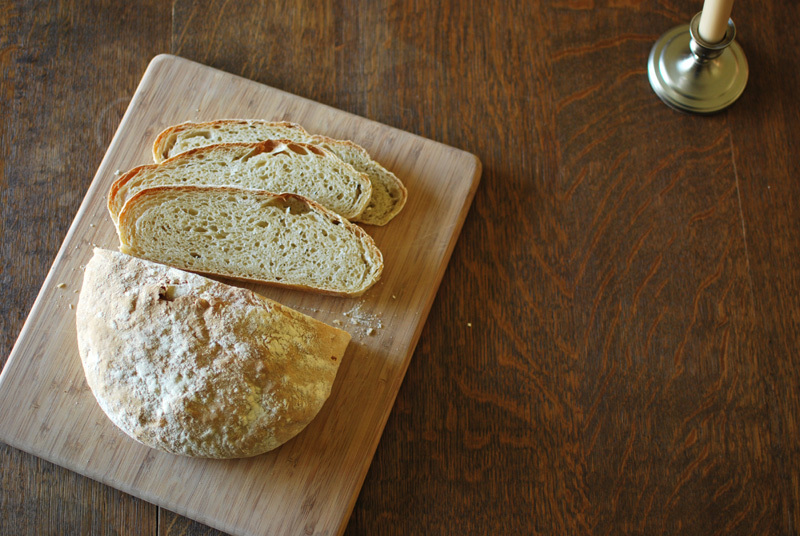 Tune in Saturday, when I’ll be talking about a second high-altitude variation of this yeast bread! 1. In the bowl of a stand mixer, whisk together the flour and yeast. Add the water and olive oil. Mix with the dough hook at low speed until a rough dough forms, about 1 to 2 minutes. Turn the mixer off, and without removing the bowl or the hook, cover the bowl loosely with plastic wrap. Let stand for at least 15 to 20 minutes, or up to 45 minutes. 2. Remove the plastic wrap, and add the salt. Continue kneading the dough, at medium-low speed. Knead for 6 to 8 minutes, or until the dough forms a cohesive ball that clears the sides of the bowl, and becomes elastic. If the dough does not clear the sides of the bowl, add additional flour until the proper consistency is achieved. The dough should not be stiff, but should not be soupy.